Dear CiloGear, First of all, I have to say that this is the best pack I"ve ever owned--stripped down for backpacking, compressed for carry-on, loaded down with groceries and taking on all kinds of non-intended use without all the useless add-ons, I'm stoked... The awesome: -The modularity combined with the light weight. Sure I guess I could get some kind of Gregory pack for backpacking, a Patagonia bag for carry-on, some something else for cragging and keep this in the garage for peak ascents but that isn't the way my life works. Everything I do always is pretty minimalist, owning lots of stuff is not practical or socially responsible, and seriously these are tools to use not toys to collect. Versatility without sacrificing simplicity is your biggest asset. -Weight is everything. Thank you for realizing this. Gregory, Mtn. Hardwear, pretty much everyone, hello????????? -Little things like the 2nd handle on the front, the thin webbing atop the shoulder straps allowing them to fold more easily, the crampon/everything pouch, the second zipper in the lid go a long way to make my life easier. -No logo. I loooove this. Also I really like knowing how involved you are with the production staff in Turkey and their general welfare. So that is basically that is my non-alpine feedback for your alpine pack. Definitely recommending it to all the folks at work, even though they keep asking if it's a Golite. Happy new year halfway around the globe! Cheers, Dirk P. in China. Dear CiloGear, Here is my feedback about the Cilogear 60L pack. I really like the pack. It saw about 100 days of use in the Cascades and Sierra, including numerous 6 day trips, cragging days, and �light & fast� alpine routes (both personally and for work). I'm psyched about its weight, configuration options, and compressibility. I'd like to see some durability improvements [zippers, framesheet pocket and a longer sternum strap] made before I would consider it ready to be the best alpine pack on the market (but it's so close!). I like the ability to carry heavy loads comfortably, which is problematic for me usually due to an old shoulder injury. -Kurt H.
CiloGear responds: We're using now zippers made in the USA and used on the International Space Station, 210d Cordura Taffeta for the framesheet pocket and we've upgraded the QA and QC in our sewing operations. The V3 packs are the best yet. Feedback from our customers, be they guides, professional climbers or folks like me and you, is our touchstone to improve our product. Dear CiloGear, In my work as a backcountry ranger here in Yosemite, I took [my 60L V2] on a 4 day patrol, and it carried beautifully, despite me picking up 20 additional pounds of garbage in the form of coils of wire, that I strapped (awkwardly, due to their size) to the outside of the pack. Overall, I'm very happy with the pack, and will keep you posted if any of that changes. -Matt N.
Dear CiloGear, I'm just back from 16 days of backpacking through Auyuittuq park on Baffin Island, which was a fabulous trip through a remote and spectacular part of Canada. The trip gave me a good opportunity to test out the 60l v2 and 20l Cilogear packs. Given the duration of the trip and the fact that we had no caches or porters, the 60l, even extended, would have been barely big enough to handle our starting loads. As I rarely need a really large capacity pack, an obvious solution was to also take along the 20l, which could then serve as a travel bag during transit, a day pack for side trips, a pillow (when stuffed with spare clothes and wrapped in a fleece) and, when mated to the back of the 60l, became an easily accessible repository for a vest, rain gear, camera lenses and a water bottle while schlepping loads. The combo worked great (the addition of the 20l didn�t noticeably change the balance or feel of the 60l) and was the envy of the �bird� brand packers (Osprey, Arc�teryx�) as whenever we did a side trip or a scramble, they found themselves either having to haul their large packs or rig a fanny pack from their lids. Despite a starting pack weight of close to 65lbs, the load balance and weight distribution of the system was excellent. Although there�s little in the way of elevation gain on the hike, the terrain is very rough, with numerous large moraines, boulder fields and creeks. The pack felt rock solid, even while clambering over wet talus or hopping from rock to rock across streams. Although I was always happy to get the pack off at the end of the day, I never had problems with sore shoulders, hips or back. By the time we�d eaten the loads down to around 40lbs, the pack was (almost) unnoticeable. One key feature of the 60l Cilogear pack which I really came appreciated is its� weight (or lack thereof). The system gives amazing performance for such a lightweight product. Compared to most other packs used on this trip, my Cilogear weighed 3lbs less out of the gate and yet was just as capable and comfortable for moving gear. The 60l v2�s construction turned out to be bomber as well, emerging unscathed from baggage holds, airport transfers, boat rides which left some of the other packs scarred and ventilated. -Grant M.
CiloGear- I'm back from Peru. What a great trip! The biggest line we ended up doing was the French Direct on Alpamayo, what a beautiful peak. I'm digitally processing all the pictures now, so I hope to have some images for you soon. The pack ROCKED the house. 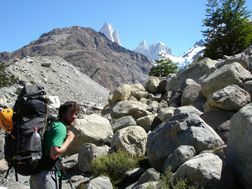 I carried some huge loads while helping porter for some people and also used it for all my ascents. Your trick with bending the framesheet worked great for my shoulder, no issues the whole trip. Doug S.
Hey CiloGear, My 60L pack made it through the summer and is in great shape! It made it up Mt Baker and Mt Shasta in the Cascades, and numerous peaks throughout the Sierra! It has worked great! Dave S.
Dear CiloGear, Just received my pack. It took me a while to figure out the straps, but really no big deal. Very cool strap system. At first glance, the pack is extremely well designed. It's clear that a lot of thought went into it. I also tossed in some rope and gear, and walking around the house, it appears to be VERY comfy. The overall bag shape is near perfect. Crampon pocket and size, strap location etc. all dead on as far as I can tell. Aaron N.
Hi, As you may remember, I summitted Mt. Rainier with it and brought my gear to a 12,000-plus foot basecamp on the Mountaineer Route on Mt. Whitney (I summitted the next day with a daypack). It is indeed very comfortable (relatively speaking, of course) with a heavy load. Norm M.